tl;dr There were some gods, a lot of assassinations, and history broke. The timeline of the Elder Scrolls universe is divided into four ages—except there are also two ages before those, and one of them is entirely non-linear and yet somehow manages to contain a sequence of events in which supernatural beings come to existence from nothing. And then, at later points in the timeline, this timeless primordial chaos leaks through into the physical world and recurs, like reality itself is having an acid flashback. The Elder Scrolls games have a complicated history, is what I'm saying. That's part of what makes them appealing to a certain kind of player. They give you the surface stuff of big, freeform open-world fantasy roleplaying, but if you want to dig for it there's more to find. There's even a recurring theme of the game's internal histories being contradictory because they're told from biased viewpoints, as if they're predesigned to be fodder for competing fan theories. This timeline presents a broad overview of things that happen on the world of Nirn, and also puts the games in order. Each of the mainline Elder Scrolls RPGs is separated by years, sometimes a lot of them, and The Elder Scrolls Online confusingly leaps back in time to fill in a gap. You don't have to know this to enjoy them, but then you don't have to read the books and yet some of us do it anyway. Getting a handle on the history and metaphysics is entirely optional, but it adds to my enjoyment and maybe if you take a dip into it, it'll add to yours too. There are multiple creation myths in The Elder Scrolls, but the easiest one to grasp is the Anuad, because it comes in a handy children's version. According to the Anuad the first two beings to exist when everything else was void are the brothers Anu and Padomay, who represent order and chaos, light and dark. Where the light and darkness mingle Nir is brought into existence, and both brothers fall in love with her. She loves only Anu, however, and their coupling brings into existence 12 words. In his jealousy Padomay kills Nir and destroys the 12 worlds, but Anu saves enough of their fragments to create one: Nirn. Anu and Padomay fight a final time, and where Padomay's blood falls it creates the demons or Daedra, while Anu's blood creates the stars, and where their blood mixes the gods or Aedra are made. That's the kid's book version. Among the first of those gods is Lorkhan, a trickster, who convinces the Aedra to create the mortal plane, while the Daedra go off to make their own planes within Oblivion. Some of the Aedra realize Lorkhan isn't being upfront about the cost of this creation, that they'll have to sacrifice much of their own power in the act. They leave for Aetherius, a plane of pure magic, allowing magicka to leak into the world through the holes their departure leaves. Other Aedra step back to resume their godhood, becoming the Divines. According to human myths the gods then create mortals, while the elves believe some Aedra stay permanently to sacrifice their immortality and become their ancestors. But before that, the Aedra convene to determine how Lorkhan should be punished for tricking them. Akatosh, dragon god of time, builds the Adamantine Tower on the continent of Tamriel to be their courthouse. Lorkhan's punishment is to have his heart torn out, and it forms the Red Mountain on the island of Vvardenfell. That's just one version of the story of course. The in-game book called The Monomyth is a handy collection of competing creation stories. Known as the Merethic Era because it's dominated by the Mer, a.k.a. the elves, this period of 2,500 years begins with the construction of the Adamantine Tower and ends with the founding of the Camoran Dynasty. In between, the elves travel to the continent of Tamriel when their homeland of Aldmeri is lost, settling in different areas. The Dwemer take up residence underground, the Altmer on Summerset Isle, the Bosmer in the forests, the Chimer (who later become the Dunmer) in Morrowind, and the Ayleids take slaves from the local human population and found the Ayleid Empire. The Orsimer are corrupted by Daedra and become the orcs, while humans from the northern continent of Atmora also emigrate to Tamriel under the leadership of Ysgramor. Ysgramor's creation of the runic language allows human recorded history to begin, ushering in the First Era and some actual dates. King Eplear unites the Bosmer wood elves, founds the nation of Valenwood, and begins the Camoran Dynasty. Harald, a descendent of Ysgramor, is crowned first High King of the Nords and declares Windhelm the capital of his nation, Skyrim. High King Vrage the Gifted of Skyrim begins a campaign of conquest in various elven lands, taking High Rock, all of Morrowind except Vvardenfell, and parts of Cyrodiil, most of which is at this time held by the elven Ayleid Empire. Human slaves in the Ayleid Empire rebel and take control of the White-Gold Tower at its centre. Their leader Alessia declares herself first Empress of the Cyrodillic Empire, goes on to formalize worship of the Divines, and is later declared a saint. A dispute over who will be crowned High King of the Nords leads to the War of Succession, and the Nordic territories outside Skyrim take this opportunity to begin struggling for independence. The Chimer and Dwemer unite to drive the Nords out of Morrowind. When the Chimer learn the Dwemer are constructing a golem called the Numidium powered by the Heart of Lorkhan and that this "brass god" is intended to become a blasphemous new deity, the peace between them is broken. They go to war at the Battle of Red Mountain, during which the Dwemer vanish—an event that's never explained. The land of Yokuda is destroyed and the survivors flee to Hammerfell, where they eventually become known as the Redguards. The city of Orsinium, capital of the orcs, is attacked by a union of neighboring kingdoms. The siege lasts 30 years, after which the city finally falls and is razed. High Rock joins the Alessian Empire. A monotheistic sect of anti-elf extremists called the Alessian Order, who have dominated the Alessian Empire since the fourth century, attempt a ritual to separate the elven god Auriel from Akatosh, the Dragon God of Time (the two are closely connected, and possibly just aspects of the same being viewed by different cultures). This goes so wrong that time shatters and the non-linearity of the Dawn Era recurs in an event called the Dragon Break. For 1,008 years time ceases to function properly. This is all just a theory, and an alternate theory states that a clerical error left official records blank during this period. Western Cyrodiil attempts to gain independence from the Alessian Empire in a decade-long conflict called the War of Righteousness. Invaders from the land of Akavir land in Tamriel, forcing Cyrodiil to unite against them, forging the Second Empire and beginning the Reman Dynasty. The Second Empire conquers Valenwood. Reman II goes to war against the Argonian lizardfolk, and their home of Black Marsh becomes an Imperial province. A truce between Morrowind and the Empire is broken when a Dunmer fortress is sacked. In response the dark elf assassins guild, the Morag Tong, murder Reman III and his son. An Akaviri Potentate takes over and declares the end of the Reman Dynasty and the beginning of the Second Era. The Mages Guild is formed by Vanus Galerion after he leaves an older magical fraternity called the Psijic Order. Galerion opposes the practice of necromancy, and proposes to make magical items and potions available to the public for a price. Potentate Versidue-Shaie declares martial law across the Empire, beginning 37 years of warfare that leaves the Imperial Legion the only military force of any strength in Tamriel. The Khajiit cat-people found the province of Elsweyr by uniting two minor kingdoms. In response to a rise in banditry due to the absence of military forces beyond the Legion, the forerunner of the Fighters Guild is founded. The Morag Tong assassinate Potentate Versidue-Shaie. Potentate Savirien-Chorak and all his heirs are assassinated, bringing the Second Empire to an end. Historians dispute who was responsible but what do you want, three guesses? No longer protected by the Empire, the rebuilt orc capital of Orsinium is sacked again, this time by the Bretons and Redguards. The Daggerfall Covenant unites High Rock, Hammerfell, and Orsinium, and the orcs are given the right to rebuild their capital one more time. A second Akaviri invasion captures Windhelm in Skyrim but is defeated after being trapped between the Dunmer and a united force of Nords and Argonians. 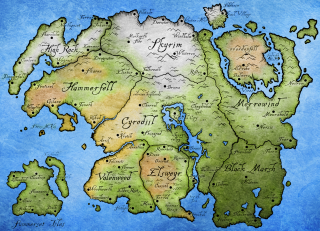 Morrowind, Skyrim, and Black Marsh sign the Ebonheart Pact to make this temporary alliance permanent. Elsweyr, Valenwood, and the Summerset Isles unite as the Aldmeri Dominion. Start date of The Elder Scrolls Online. Tiber Septim begins the Tiber Wars in an attempt to unite the nations of Tamriel and form the Third Empire. Start date of The Elder Scrolls Adventures: Redguard. Tiber Septim uses a rebuilt Numidium to complete his conquest of Tamriel, destroying the golem afterwards. Then he declares the Second Era over. Tiber Septim dies. Followers of Talos believe he ascends to godhood. Start date of An Elder Scrolls Legend: Battlespire. The Camoran Usurper invades Valenwood. Start date of The Elder Scrolls: Arena. Start date of The Elder Scrolls 2: Daggerfall. Start date of The Elder Scrolls 3: Morrowind. Start date of The Elder Scrolls 4: Oblivion. In Vvardenfell the large rock containing the Ministry of Truth that hovers over Vivec falls, devastating the city and causes floods and landslides. The Red Mountain erupts. The elven supremacist faction called the Thalmor take over Summerset Isle, and the high elves leave the Empire. Within a decade they take Valenwood as well, beginning a new Aldmeri Dominion. During the 'Void Nights' both moons, Masser and Secunda, vanish from the sky. The Khajiit, who are bound to the Lunar Lattice and whose children have adult forms determined by the phase of the moons they're born under, are particularly distraught. When the Thalmor take credit for the moons' return, Elsweyr agrees to join the resurgent Aldmeri Dominion. The Aldmeri Dominion and the Empire sign a treaty called the White-Gold Concordat, agreeing to enforce a ban on Talos worship. Start date of The Elder Scrolls 5: Skyrim. If you managed to make it all the way through this, why not follow it up with Major events in the Fallout timeline?